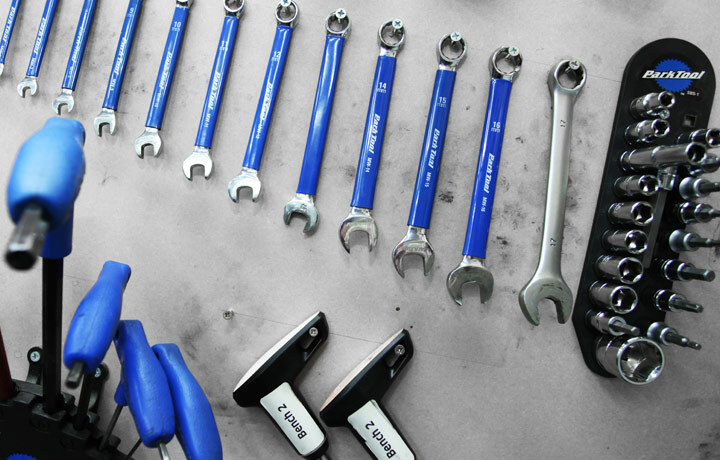 Our Servicing & Repairs department is a great place to come for routine maintenance and repairs for your bikes. We employ a small crew of experienced and helpful technicians who understand that you are here to have your bike improved, not to make it worse! Just turn up with your bike and we will get you booked in. Head over to our Servicing & Repairs page here for more detail. It will open in a new window. Full Overhaul £279 - This cost covers a full strip and rebuild of your bike back to a bare frame. We’ll service both hubs, headset, and bottom bracket while also chasing any threads. We will precision true both wheels in the jig with the tyres off. All parts will be removed and hotwashed, and the frame, fork, and wheels will be detail cleaned. The freshly cleaned (or replacement) parts will be reinstalled. Fresh brake and gear cable sets will be installed after which we will lube the parts and tune everything in. All bolts and fasteners will be torqued to specification. Tyres will be inflated to the correct pressure. The overall condition of the bike will be noted along with any recommendations and wear which you may need to monitor. The bike is road tested. All parts are extra. Price includes VAT at the current rate. Premium Service with Parts Hotwash £119 - A Premium Service with Parts Hotwash will go deep into your bike’s workings. We’ll remove and hotwash or clean the drivetrain components including the derailleurs and also the brakes. The frame, fork, and wheels will be wiped clean. We will lube the parts and tune everything in. All bolts and fasteners will be torqued to specification. Tyres will be inflated to the correct pressure. The overall condition of the bike will be noted along with any recommendations and wear which may need to be monitored. We will road test your bike and if it needs additional modules of work (e.g. installation of new gear or brake cables), these modules can be added at a specially reduced rate for being part of a service. All parts are extra. Price includes VAT. Tune Up & Safety Check £59 - Think of our Tune Up & Safety Check like the MOT test you legally require for your car. We make adjustments to keep things running sweetly. We’ll tune in the brakes and gears, torque check the tightness of bolts and fasteners, inflate tyres to the correct pressure. The overall condition of the bike will be noted along with any recommendations and wear which you may need to monitor. We will road test your bike and if it needs additional modules of work (e.g. installation of new gear or brake cables), these modules can be added at a specially reduced rate for being done as part of a tune up. All parts are extra. Price includes VAT. Parts are extra and we prefer that parts are purchased from us as we trust our suppliers not to supply sub-standard or counterfeit goods. We are happy to install parts purchased elsewhere but as the purchase of these parts is not from us any goodwill support with these items will be between you and your supplier. Please ask for further details if you require them.